Aim: The objective of this study was to analyze the application of PA agent that improves the bond strength of root dentin treated with NaOCl. Materials and Methods: Group 1: root canals were irrigated using 0.9% isotonic saline as an irrigant (negative control); Group 2: root canals were irrigated using 5.25% NaOCl (positive control); Group 3: root canals were irrigated with 5.25% NaOCl followed by 10% sodium ascorbate for 10 minutes; Group 4: root canals were irrigated with 5.25% NaOCl followed by 5% PA for 10 minutes. All the canals were then coated with self-etch dentin bonding agent, filled with resin cement, stored for one day in water, and then cross sectioned into three slabs of 2-mm thickness that were prepared and tested for microtensile bond strength. Results: The results demonstrated that 5.25% NaOCl caused significant reduction (P<0.05) in the bond strength, but this can be reversed by 5% PA significantly more than the 10% sodium ascorbate. Type 1 collagen in dentin is essential for many structural roles such as scaffold for mineralization and viscoelasticity by forming a rigid, strong, space-filling biomaterial. PAs stabilize and increase the cross-linkage of type 1 collagen fibrils by the hydroxylation of proline which is an essential step of the collagen biosynthesis. Intermolecular crosslinking is the prerequisite for stability, tensile strength, and viscoelasticity of the collagen fibrils. The strengthening of collagen fibrils by crosslinking agents such as PAs to increase the mechanical properties and decrease enzymatic degradation is a significant step in adhesive dentistry.­  Hence, the purpose of this study was to evaluate the restoration of bond strength using grape seed extract as compared with that of sodium ascorbate. Two solutions were prepared for this study. For the first solution, 5 g of grape seed extract in the form of powder (Puritans Pride Inc, Oakdale, NY, USA) was collected from the capsules and dissolved in 100 ml of sterile distilled water to make 5% PA solution. For the second solution, 10 g of sodium ascorbate powder (SDFCL, Sd fine chem. limited, Mumbai-30, India) was dissolved in 100 ml of distilled water to make 10% of sodium ascorbate. A total of 40 extracted human single-rooted teeth were used in this study. They were extracted for periodontal and orthodontic reasons. The teeth were cleaned of calculus and debris and stored in saline. The crowns were decoronated at the cementoenamel junction such that standard lengths of 18 mm of roots were obtained. The 40 teeth were then randomly distributed into four groups of 10 teeth each. The instrumentation protocol was same for all the groups. Canal space was enlarged using Gates-Glidden drills (Mani, Tochigi, Japan) of sizes #3, #4, and #5 in a slow-speed contra-angle hand piece and hand instrumentation using K-files (Mani, Inc, Tochigi, Japan) up to #70. The irrigation protocol during instrumentation varied as follows: in Group 1, teeth had their root canals irrigated using 0.9% saline as an irrigant (negative control); in Group 2 to 4, the irrigation was performed with 5.25% NaOCl (Prevest Denpro Limited, Jammu, India) followed by Ethylene diamino tetra acetic acid (EDTA) (Glyde TM , Dentsply Maillefer, Ballaigues, Switzerland) and 2% chlorhexidine (CHX) (Asep-RC, Steadman Pharmaceuticals Pvt Ltd, Thiruporur, Tamil Nadu) during the preparation of the root canal, as is done clinically. The total time of exposure to NaOCl, EDTA, and CHX was estimated to be15 to 20 minutes per tooth. No further treatment was done for Group 2 (positive control). In Group 3, after irrigation with 5.25% NaOCl and 2% CHX, the root canals were rinsed with 10 ml of water. The canals were then rinsed with 10 ml of 10% sodium ascorbate for 10 minutes. For Group 4, after irrigation with 5.25% NaOCl and 2% CHX, the root canals were rinsed with 10 ml of water. The canals were then rinsed with 10 ml of 5% PA for 10 minutes. After the irrigation protocol for each group, all the canals in groups 1 to 4 were rinsed with 10 ml of water and the canals were dried with paper points. The canals were then etched with 37% phosphoric acid, rinsed, and blot dried. The canals were coated with self-etch dentin bonding agent (Adper TM 3M/ESPE, MN, USA) according to the manufacturer's instructions. Then, the canals were filled with resin cement (RelyX TM 3M/ESPE, MN, USA) with the help of lentulo spirals. The self-curing resin was allowed to cure undisturbed for 5 minutes. The filled specimens were then stored in 25°C water for 24 hours to prevent dehydration. Then, the specimens were removed from the water, dried, and sectioned into coronal, middle, and apical third of 6 mm each by using a diamond disc . The central 2-mm thick sections were made from each coronal, middle, and apical third section. The buccal and lingual dentin portion of each slab was then cut away to permit tensile testing of the root canal-resin interface. The specimens were then glued to a custom-made jig with cyanoacrylate resin. Universal testing machine was used to ensure that pure tensile force was applied to the bonded interface during testing in a universal tester operated at 1 mm/min. Each specimen was stressed in tension until failure occurred on either side of the resin-bonded canal. The load at failure was divided by the surface area (approximately 1.8 mm 2 ) to obtain the failure stress that was expressed in MPa. Mean and standard deviation were estimated for each study group. Normality of the data was tested in each group by using Kolmogorov-Smirnov test. 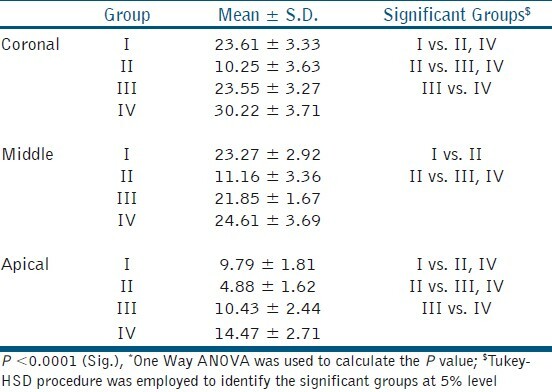 Mean values were compared between different study groups by using One way ANOVA followed by Tukey-HSD procedure. Statistical significance was defined as P<0.05. The effects of the various treatments on the bond strength of root canal dentin are shown in the [Table 1]. The bond strength is the maximum in Group IV (30.22 ± 3.71), followed by Group III (23.55 ± 3.27) and Group I (23. 6 ± 3.33). Group II (10.25 ± 3.63) exhibits the least bond strength among all the other groups. Within sub-groups, coronal third reveals the maximum bond strength, followed by middle and apical third. Group IV (PA) exhibits statistically higher value than all the other groups in coronal, middle, and apical third with respect to bond strength. PAs are found in high concentrations from natural sources such as grape seed extract, cocoa beans, pine bark extract, cranberries, lemon tree bark, and hazel nut tree leaves. Grape seed extract was chosen for this study since it yields a 10% higher concentration of PAs. This PA is designated as PA B2-3'-0-gallate. PAs are high molecular weight polymers comprised of the monomeric flavan-3-ol (+) catechin and (-) epicatechin. As a naturally occurring plant metabolite, PAs have been proven to be a safe antioxidant in various clinical applications and dietary supplements. OPC contains multiple electron donor sites (hydroxyl sites) that allow it to bind to unstable molecules called free radicals by donating its hydrogen atoms. OPC also recycles other antioxidants such as Vitamin C and glutathione by removing the free radicals they bind with and freeing them up to interact again with other free radicals. The presence of gallic acid also increases the free radical scavenging activity. Collagen in biological tissue is strengthened by the formation of native cross links which provides the fibrillar resistance against enzymatic degradation as well as greater tensile properties. Natural crosslinkers such as PAs can increase the number of inter- and intramolecular cross links. This is probably the first study undertaken to evaluate the bond strength restoration ability of PA as compared with ascorbate. In this study, 5% OPC (group 4 [30.22 ± 3.71]) showed the maximum bond strength among all the groups. There was a significant difference (P<0.05) in the bond strength between 5% OPC (group 4 [30.22 ± 3.71]) and saline (group 1 [23.6 ± 3.33]) and also between 5% OPC (group 4 [30.22 ± 3.71]) and 10% sodium ascorbate (group 3 [23.55 ± 3.27]). The probable reason may be that the antioxidant ability of OPC is 20 times more than sodium ascorbate and also it can be quickly and completely absorbed. The scavenging potential of gallic acid present in OPC is also a critical factor in maximizing the bond strength. Collagen crosslinking and stabilization property of PA is also an important factor for the increased bond strength. 0Grape seed contain PAs which improves the bond strength significantly more than ascorbate due to its high antioxidant and collagen crosslinking ability. As PA increases bond strength, additional research may be needed to determine whether OPC might improve the bond strengths of all adhesives to NaOCl-treated root dentine. 1. Rahimi M, Jainaen A, Parashos P, Messer HH. Bonding of resin based sealers to root dentin. J Endod 2009;35:121-4. 2. Weston CH, Ito S, Wadgaonkar B, Pashley DH. Effects of time and concentration of sodium ascorbate on reversal of NaOCl - induced reduction in bond strengths. J Endod 2007;33:879-81. 3. Schwartz RS. Adhesive Dentistry and Endodontics. Part 2: Bonding in root canal system - the promise and the problems: A review. J Endod 2006;32:1125-34 . 4. Morris, MD, Lee KW, Agee KA, Bouillaguet S, Pashley DH. Effects of sodium hypochlorite and RC-Prep on bond strengths of resin cement to endodontic surfaces. J Endod 2001;27:753-7. 5. Lai SC, Mak YF, Cheung GS, Osorio R, Toledano M, Carvalho RM, et al. Reversal of compromised bonding to oxidized etched dentin. J Dent Res 2001;80:1919-24. 6. da Cunha LF, Furuse AY, Mondelli RF, Mondelli J. Compromised bond strength after root dentin deproteinization reversed with ascorbic acid. J Endod 2010;36:130-4. 7. Fine AM. Oligomeric proanthocyanidin complexes: History, structure, and phytopharmaceutical applications. Altern Med Rev 2000;5:144-51. 8. Castellan CS, Pereira PN, Viana G, Chen SN, Pauli GF, Bedran-Russo AK. Solubility study of phytochemical cross-linking agents on dentin stiffness. J Dent 2010;38:431-6. 9. Bedran-Russo AK, Pereira PN, Duarte WR, Drummond JL, Yamauchi M. Application of crosslinkers to dentin collagen enhances the ultimate tensile strength. J Biomed Mater Res B Appl Biomater 2007;80:268-72.